Just as we posted our daily update which featured the Uber Calgary launch and linking your Uber account to SPG we got the following in our email! TORONTO, October 15, 2015 – Mobile app-based transportation company, Uber, today announced a national partnership where new Uber riders will receive AIR MILES Reward Miles. 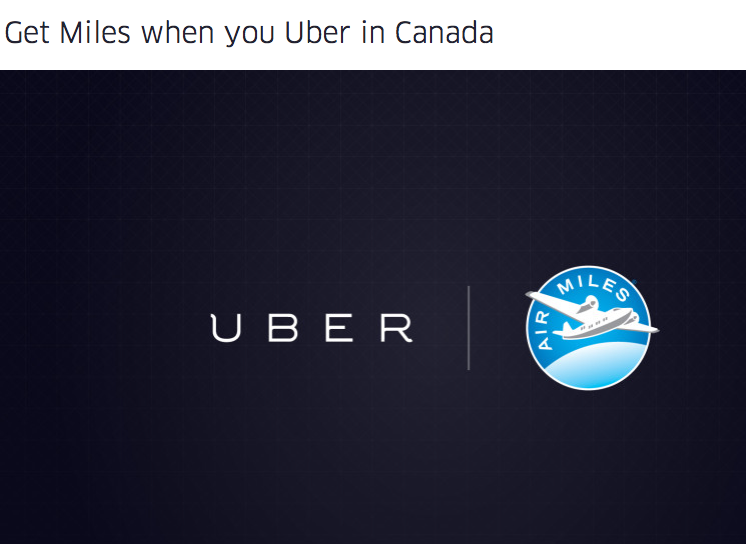 We’re excited to announce a new partnership with AIR MILES in Canada, where Uber users will get 100 Miles* after taking their first ride. Today only, to celebrate, we’re placing special AIR MILES cards in cars in Toronto, Ottawa, Edmonton, Montreal, and Quebec City. Request your Uber, and you’ll be gifted a special mystery amount of Miles from your driver! Open your Uber app and punch in the promo code AIRMILES under the promotions tab (top left) to unlock the ‘AIR MILES’ option. Starting at 5:00pm select the ‘AIR MILES’ option in your app and request a ride. If you connect with a driver, you’ll get mystery Miles during your ride, and you might just win enough Miles for a round-trip flight for two! Demand for ‘AIR MILES’ will be extremely high and not all requests will be fulfilled. Available while supplies last. Learn more about the new AIR MILES and Uber partnership here.